Home » about me » What Books Influenced Me? Today I crawled out of bed, tired from a night of fighting aliens, dodging chainsaws, and seeking public approval (or just book sales), to find I'd popped up on another great blog. Visit Bloomin' Brilliant Books to find out what books influenced me, then stay on Abbie's site a while for all the other great articles and reviews. See you there. Here's a backup of the post. 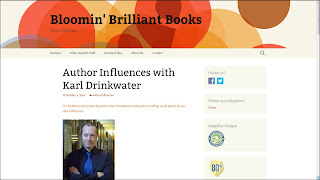 I’m thrilled to be joined by author Karl Drinkwater today who is telling us all about his author influences. Enid Blyton, Roald Dahl, and any ghost stories (especially the Armada Ghost Books edited by Mary Danby). I would climb the weeping willow to read the latter. I also adored Harry Cat’s Pet Puppy (George Selden, 1975). I remember crying at the end of it. I really should read it again one day, and buy copies for presents. I loved it. I made up stories from an early age, read continuously, and always came top in English classes. It was the only subject I did well in at secondary school, and I often contributed fiction and poems to the school magazine, Urmstonian. Though I cringe when I re-read them now. I read horror books for escapism and literary books for style. I write in both genres so that works out well. Well, I write in two genres already, which is seen by many as a no-no. Though some of my work mixes the two, so maybe the twain shall meet. I think the pure readability of Stephen King and Dean Koontz inspired me a lot in my teenage years when I spent all my pocket money on their novels. I wanted to be able to write books where the reader forgets it is a book. Some of my thriller/horror works have been compared to Koontz, and the more character-based stories to King, so maybe a teeny bit of their magic rubbed off. One of the short stories in my last collection was called Just Telling Stories and was a mini-homage to some of the creepy tales that seasoned my imagination. Strangely, no, not any more. I tend to enjoy individual books – even when I really enjoy one it doesn’t mean I’ll always seek out other works by that author. If you think about it, any author who writes a lot has two options. One is to keep writing to the template that made them famous, because it sells and it is what readers expect. Downside: the books become increasingly familiar and predictable. The effect is diluted. The other option is for the author to try new things. Downside: they may annoy fans by not fulfilling their expectations. If every book is different there’s no guarantee that every book is good. Either way, I try to read great books regardless of who wrote them, rather than follow just one author. I enjoy trying new things in my own writing, so have created novels about finding love in Manchester, and about being chased across a Welsh island by murderers; stories about haunted museums, and about a child trying to show love to a parent whatever the cost. One end of the spectrum to the other. The opening to The Descent by Jeff Long wowed me. I couldn’t understand how he’d achieved such a gripping effect. The whole book was good but couldn’t match the ever-so-subtle menace of the opening, stuck in an icy cave in mountains during a storm. Sometimes books that take an escalating concept and just push it to its max can amaze me in the way they achieve the effect. For example Ender’s Game by Orson Scott Card, or the wildness of Battle Royale by Koushun Takami (lovely cover and book design on that one too). I joke that my two Manchester novels, Cold Fusion 2000 and 2000 Tunes explain how I came to leave Manchester (they are set around the time that I moved from there to Wales). I say no more. A huge thank you to Karl for taking part!